Scarification is a medical practice which was popular until the early nineteenth century and which thankfully has now been consigned to the history books (and blogs). In concept similar to – but less dramatic than – bleeding, it entailed using a rough implement or blade to make abrasions on the surface of the body. In theory it allowed the evacuation of small amounts of blood, and with it the toxins or pathogens causing disease. The treatment was used on various parts of the body, including the tonsils. 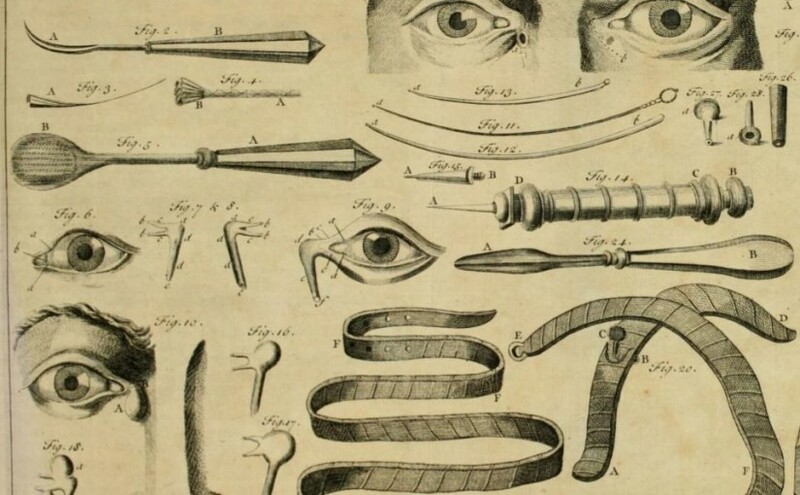 But a surgical textbook published in 1718 contains a still more painful use for scarification: treating diseases of the eye. This is from Chururgie [‘Surgery’] by Lorenz Heister, a distinguished German anatomist and surgeon. It was translated into many languages and remained the standard text on surgery throughout Europe for many decades. To scarify the Patient’s Eye, he must be first seated on his Chair or Bed in an advantageous Posture against the Light, with his Head secured from moving by an Assistant, after which the Operator presses his Thumb and Fore-finger on the Eye-lids, so as to elevate, or open, and turn them outward, that their interior red Surface may come into View, which may be done with most Ease in the lower Eye-lid. He now takes his scarifying Instrument in the other Hand, and rubs it backward and forward with great Swiftness upon the internal Surface of the Lid, and upon the White of the Eye itself, if he thinks proper, and sometimes even upon the Cornea, moving from one Corner of the Eye to the other, so as to lacerate the small turgid Veins, and make them bleed plentifully. As a veteran of eye injuries and associated treatments, I can say with some authority that this would have hurt. A lot. The Instruments used by different Authors for this Operation, are various: Hippocrates seems to have used a sort of prickly Thistle. Some of the ancient Physicians scarified with a small Steel Rasp in the Shape of a Spoon, with which they rubbed the internal Surface of the Eyelid till it bled… Others use the rough Plant named by Botanists Equisetum magis nudum, which seems to be very well adapted to the Intention. Others again recommend the Pumice-stone. Imagine that: a thistle or pumice stone being rubbed vigorously over your cornea. But the latest and best Instrument for this Operation is found to be the Beards of Barley or Rye, which are furnished with Rows of small Teeth or Hooks. Ten, twelve, or fifteen of these Beards are to be cut and tied together by a String, so as to resemble a sort of Brush for Clothes, the Teeth of each Beard or Spike being turned outward all round, their slender Ends form a sort of Handle, to be held and worked round and across by the Fingers, to scarify the inside of the Eye-lids, and the Eye. Patients will be not much reassured to learn that this instrument of torture has a wide range of applications. This Eye-brush, or Scarificator, is said by the Author, Mr. Woolhouse, to be very useful in all Disorders of the Eyes which require bleeding, as when the small Vessels are obstructed, and the whole Eye inflamed, whether from external or internal Causes, as a Blow, Wound, Cataract, Pterygium, Hypopion, Staphiloma, or the like, in which Cases the internal Surface of the Eyelids should be chiefly scarified, in order to discharge the hesitating Blood. These days many surgical implements are disposable, one-use-only affairs. The eye-brush was apparently an early example of such an instrument. With regard to the Eye-brush before described, it is to be observed, that Concerning a small Force will blunt it, and therefore it cannot well be used more than once; a new Brush must therefore be provided against every Operation. ‘Tis to be likewise observed, that the Beards of old Barley are not so proper as those of new, which is not altogether full ripe; because the first, being very brittle, will be apt to shatter, and leave some of its Teeth behind in the Coats of the Eye, which may be followed with bad Consequences. For the same Reasons also it should not be the Product of too rich a Soil, nor have passed under the Action of the Flail in threshing the Grain. But it seems that even Herr Heister has doubts about the eye-brush. After all I must confess, that, upon Trial, I never could experience any My Opinion great Effects from this Operation, which I have frequently performed in Disorders of the Eyes… Even the most prudent Oculists are obliged to own, that the Practice is beset with many Inconveniencies in the very Disorders to which it is most adapted; nor can we meet with Examples enough of its good Effects to over-balance the Danger and excruciating Pain that attends it. I would therefore advise the young Surgeon not to be over-fond of his new Eye-brush, nor bring it into his Practice but in Cases of the last Necessity, when all other Means are ineffectual. I very much hope never to encounter a surgeon equipped with a barley eye-brush.